ST. LOUIS, Jan. 17, 2017 /PRNewswire/ -- When it comes to filling out a winning bracket, what's your strategy? Do you study team history and statistics or are you a fan of the upset? 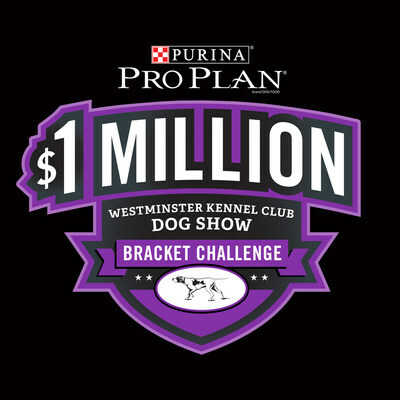 Back by popular demand, the Purina Pro Plan $1 Million Westminster Kennel Club Dog Show Bracket Challenge rallies fans to apply their best bracket strategies to correctly predict the seven Westminster group winners and the top prize, "Best in Show," for a chance to win $1 Million. Dog-lovers and sporting enthusiasts alike are invited to put their "barketology" skills to the test when more than 2,800 elite dogs from across the country compete for top honors on Monday, Feb. 13 and Tuesday, Feb. 14 at the 141st Annual Westminster Kennel Club Dog Show, presented by Purina Pro Plan. To play, fans can visit www.DogShowBracket.com and choose one winner from the Hound, Toy, Non-Sporting, Herding, Sporting, Working, and Terrier groups, and from those winners, one overall breed they believe will win "Best in Show." After completing the bracket, entrants can tune into the Westminster Kennel Club Dog Show on Fox Sports 1 (FS1) on Feb. 13 at 8 p.m. EST and Feb. 14 at 8 p.m. EST to follow their bracket in real time. If their selections match the actual winners, they could win $1 Million, with the prize being split evenly among all verified winners. "We're excited to give dog-lovers another chance to get in on the Westminster action as they select and cheer on their favorite breeds," said Christi Maginn, Brand Director, Purina Pro Plan. "No matter which dog comes out on top in the game of 'barketology,' Purina Pro Plan believes that any dog can be a champion – whether they're in the ring or curled up next to you at home." Purina Pro Plan has a rich history in the sport of purebred dogs and has been the food of choice for elite dogs to excel through nutrition that performs. The brand is also aiming to extend its winning legacy and celebrate another Purina Pro Plan-fed dog taking home the "Best in Show" title for the eleventh straight year*. Fans can follow @ProPlan on Twitter and Instagram for live Westminster coverage and use #WKCDogShow to join the conversation. For more information, including a Dog Show 101 tutorial, visit www.DogShowBracket.com. Purina Pro Plan is the food of choice for the past 10 Westminster Best in Show winners*. Our goal is to give your dog the nutrition to be his absolute best, helping him to be energetic and resilient, and maintain an ideal body condition, healthy skin, and a stunning coat. Because being the best he can be means something different for every dog, our wide range of dry and wet foods and snacks, sold exclusively at pet specialty stores, can be found in five specialized categories formulated for a dog's unique needs. For more information, visit www.proplan.com or follow @ProPlan on Twitter, Instagram, Facebook, or Google+. The brand is manufactured by Nestle Purina PetCare, which promotes responsible pet care, humane education, community involvement, and the positive bond between people and their pets. A premiere global manufacturer of pet products, Nestle Purina PetCare is part of Swiss-based Nestle S.A., a global leader in nutrition, health, and wellness.